"I received my birthday bracelet from Corinne in August of 2013. 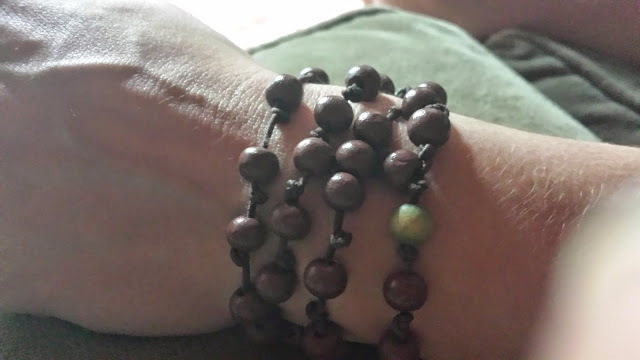 It was brown beads on a brown band with one green bead on it. She said, 'That is your birthday wish bead, make a wish and wear the bracelet until it comes true.' I made my wish, a few actually, and wore it for the past year. The green color of the birthday wish bead gently faded or 'seasoned' as I wore it and re-strengthened my wish. My wish did come true, so I can tell you what I wished for; I wished that I would complete my doctorate degree before my August birthday. So May 17th I walked across the stage and officially received the hard-earned title of Dr. Coffee! Since my wish came true, I knew I needed to give the bracelet away. I met up with my mom a few weeks after graduation and she didn’t have 'any beads on' so of course, I gave it to her. She loved the simplicity and that it was already 'seasoned.' This was in one of Corinne’s first bracelet batches and the knots were less smooth so the bracelet didn’t lay flat. My mom loves that about the bracelet and that she can also wear it as a necklace. 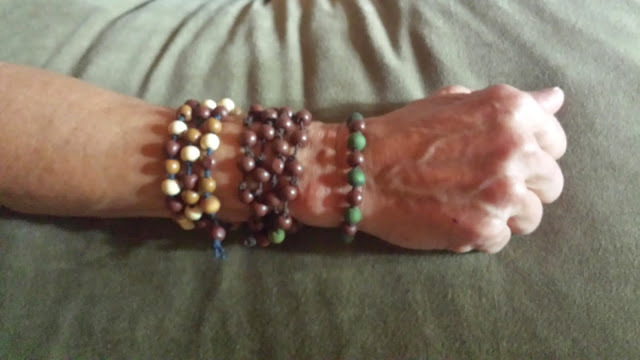 She has made her wish, or a few, and wears it now daily."